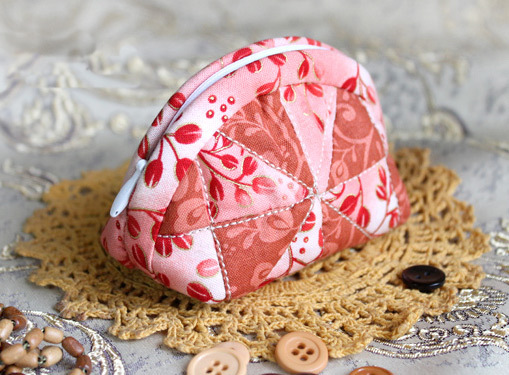 Cosmetic bag in patchwork technique ~ DIY Tutorial Ideas! So, to start sewing. 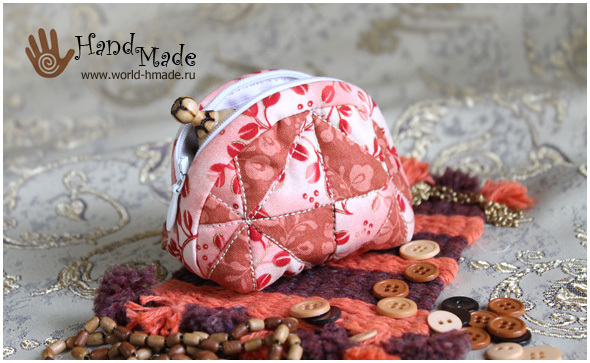 For sewing cosmetic bags we need cotton fabric in two colors. 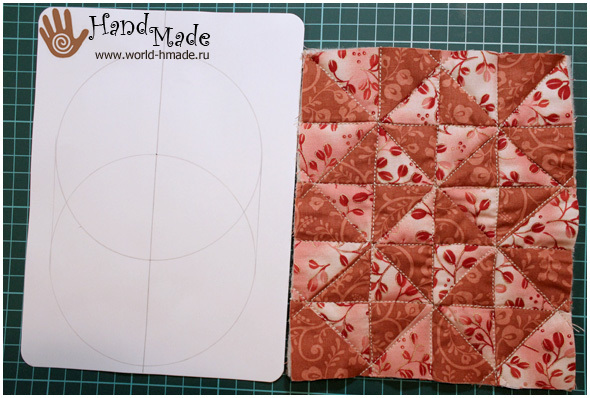 From fabric to cut out 10 squares with a side of 10 cm: 5 squares of the same fabric, 5 - from another. 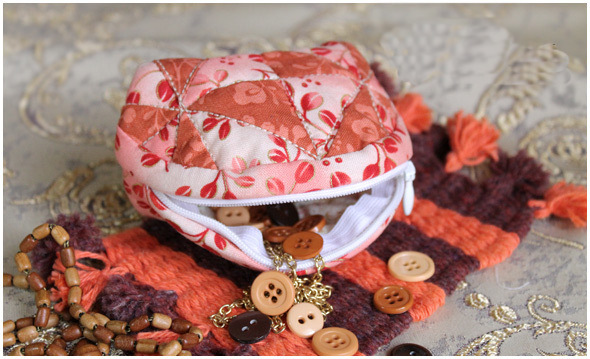 Let's start with the block for cosmetic bags. 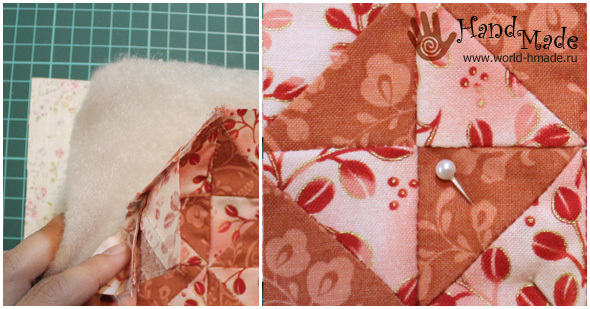 Put one square of brown fabric on the fabric square with red sprigs front side of each other. Stitched by details of the two diagonals. 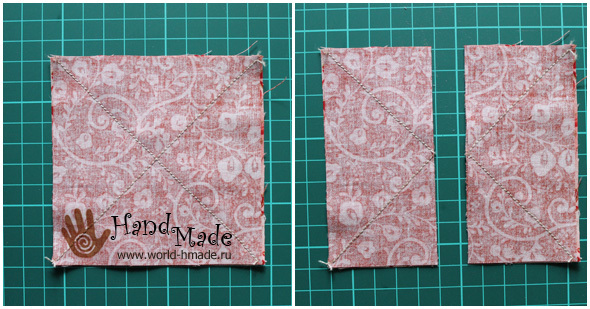 Cut the stitched squares vertically in the middle. 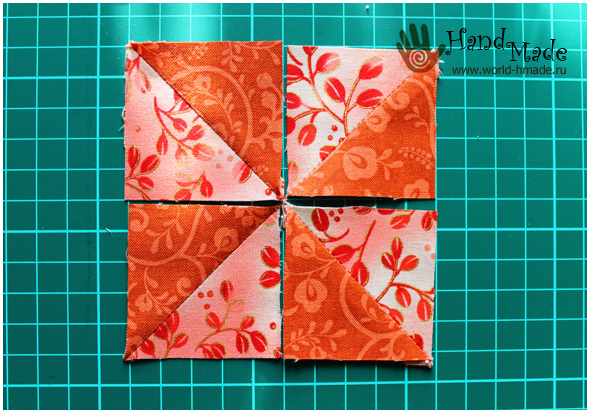 Square cut on the horizontal center line. 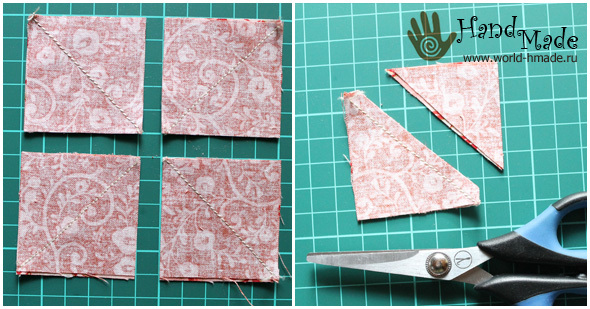 After that, cut the triangle on the diagonal of a square. We will need to get a little two-colored squares. Thus we prepare all the squares, and then press out the seams. 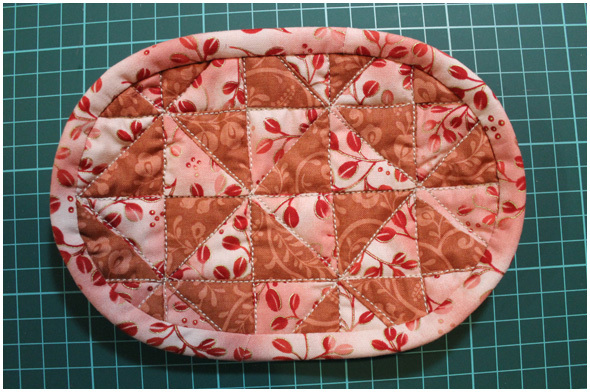 Sew the squares into a single canvas from 20 squares. 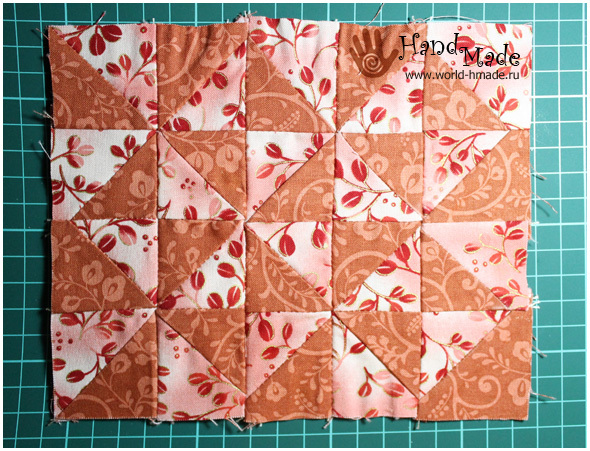 Quilt requires a patchwork front part (the one we just built from squares), the rear part of the whole fabric and cushioning between them. 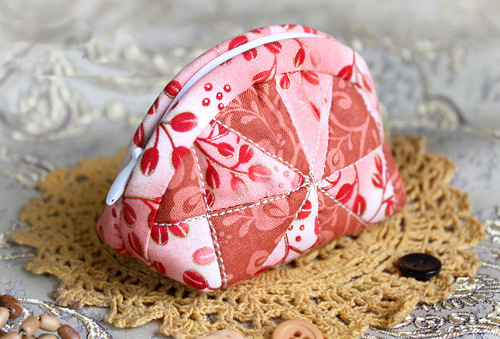 For sewing cosmetic bags as cushioning material using thin sintepon. 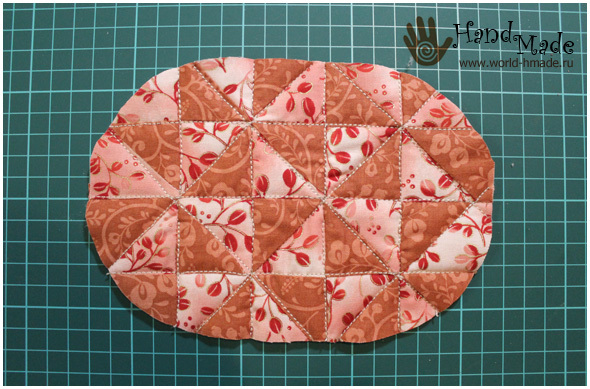 Fold all three layers: first the whole underside of the fabric facing you, then sintepon and finally patchwork front part of the front side facing you. Perform stitch. 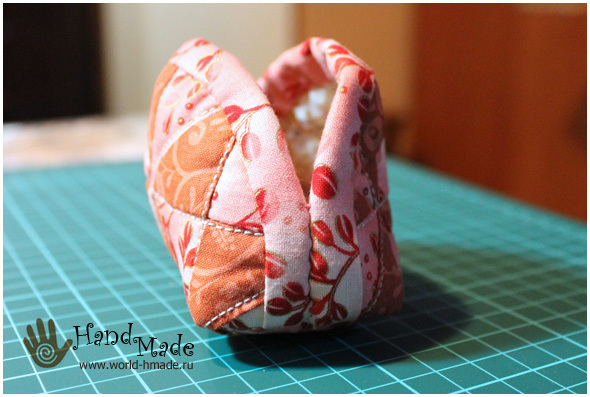 It can be done by hand or on a sewing machine. Machine stitch a straight stitch is performed along parallel lines. 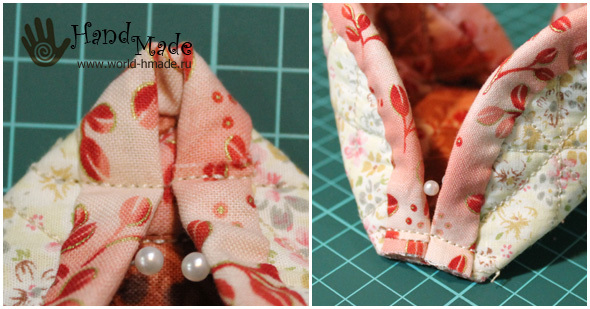 When stitch make sure that, to the rear portion were not formed folds. It's time to move on to reveal just cosmetic bags. To do this we will need cardboard dividers. Radius equal to about one block (consisting of 4 small squares), two draw a circle. Distance from the center of the upper circle to the center of the bottom is equal to the radius. Getting machining the edges. 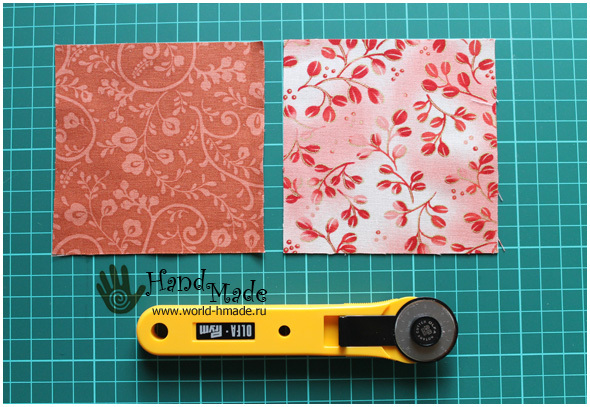 To do this, cut out a strip width of 4-5 cm. 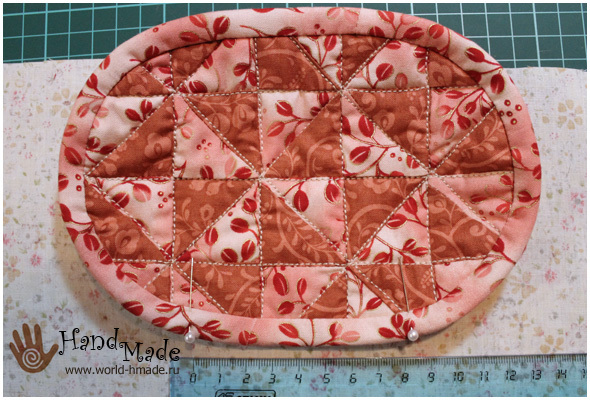 Sew it to quilted the canvas as shown in the photo. Divide in half and back down from the middle of 4 cm and 4 cm right to the left. Pin up these points with pins. Bend at the center line, turning to her side. We step back from the edge of the corner about 2 cm and stitched by a straight line. The raw edge can be hidden, sew him a strip of cloth. Wrenched cosmetics bag and a hidden seam sew side to the points marked with pins. Hand sewn zipper. 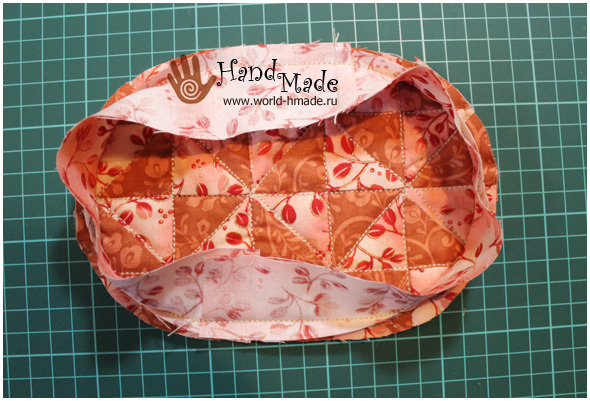 Cosmetic bag in the technique of patchwork ready! We admire the result! Très jolis ouvrages que je réalise aussi, sans utiliser le patchwork. Je viens de découvrir ce site que je trouve bien "agencé".